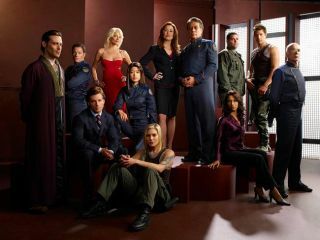 The cast of TV's 'Battlestar Galactica' on the Syfy Channel. NEW YORK – Fans of the revived science fiction TV show "Battlestar Galactica" might have foreseen the ending of the series, if only they'd paid attention to the science behind the show, an author revealed Saturday at New York Comic Con. At the end of the fourth and final season of the 2004-2009 Syfy Network series, it was revealed that humans on Earth today are the descendants of an ancient race of human ancestors and artificial beings called Cylons, according to the show's mythology. For those who were looking, there were clues planted all along that this was the case, said Patrick Di Justo, author of a new book, "The Science of Battlestar Galactica." "We had the story in the second season and pretty much no one put it together, but the clues were all there," Di Justo said. For example, in an early episode a half human, half Cylon fetus is examined by a doctor onboard the ship Battlestar Galactica. The doctor announces the child, Hera, has no blood type – her blood has no antigens. The doctor and the scientist present are shocked and amazed. Yet, "I have no blood type. Approximately 40 percent of you have no blood type," Di Justo told the NY Comic Con audience. For homo sapiens, this is normal – having "no" blood type, i.e. blood without antigens in it, just means a person has Type O blood – a fairly common occurrence for us. But among the "humans" on Battlestar Galactica, apparently no one had Type O blood; everyone had A and B types. The Cylons, however, apparently had Type O blood, which is a mutation of Type A blood, Di Justo said. These facts imply that modern humans, with our diversity of blood types, are descended from both the Battlestar humans and the Cylons, in the universe of the show. Another revealing clue was planted in season three, Di Justo said. Cylons get sick with a disease called lymphocytic encephalitis, but the humans on the show are immune to it. This disease also exists in the real world, but humans in reality are not immune to it. The disease, spread by rats and mice, leads to fever and swelling, and can occasionally be fatal. "There we are once again in the middle of the third season, we didn't know consciously where the show was going, but here is a great clue," Di Justo said. The fact that the colonial humans on Battlestar Galactica are immune to the disease, and we are not, implies that we might be descended from a mix of colonial humans and cylons, in the show's universe. Even though the show was primarily character- and plot-driven, science played an important role in shaping the series, said Di Justo and his co-author, scientist Kevin Grazier, who served as the official science advisor to the show. Grazier works at NASA's Jet Propulsion Laboratory in Pasadena, Calif.
And the writers strived to keep the futuristic show rooted by believable science, they said. Producers would often consult Grazier about the accuracy of plot points, and ask for story ideas that fitted in with realistic science. "There are moments when technology affects you and the scene in a dramatic way," agreed actor Richard Hatch, who portrayed the character Tom Zarek in the new series, and played Captain Apollo in the original series. "When the writers are being innovative and creative they find a way to let the technology affect the scene." Yet sometimes, the demands for good television win out over scientific concerns. "There are times when you have to stretch the science," Grazier said. "There are some times when you have to cheat to tell a story."